Penny Lyons is well known in the Taupo community, both as a local resident and as a successful business woman with a sales and management career spanning 20 years at one of New Zealandâ€™s top radio offices in the country. Penny has been instrumental in bringing New Zealand Sothebyâ€™s International Realty to Taupo and as a Director of the Taupo and Rotorua Lakes business she brings a unique mix of leadership skills, extensive sales experience, marketing expertise and a love and knowledge of the local community to the role. Pennyâ€™s love of client relationships and her exceptional standard of client care is at the forefront of everything she does and she prides herself on the sense of trust and honesty she builds with her clients and the local community. 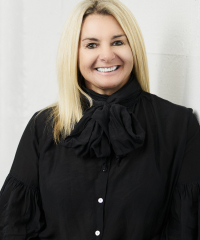 Following through on her word is important to Penny and she brings her outstanding commitment to customer service to her role as selling member of the Sothebyâ€™s International Realty team. Pennyâ€™s second love has always been the Taupo community and improving, enhancing and nurturing it at every chance. Through her love of the local community, Penny and her partner worked together to set up the 100% Lake Taupo Charitable Trust which have organised events raising more than $1,000,000 for over 100 Taupo non-profit organisations. Penny has also sat on numerous Taupo Lakes District boards such as Town Centre Taupo, Taupo Intermediate School and currently still sits on Taupo Chamber of Commerce and Industry and Enterprise Great Lake Taupo Boards.